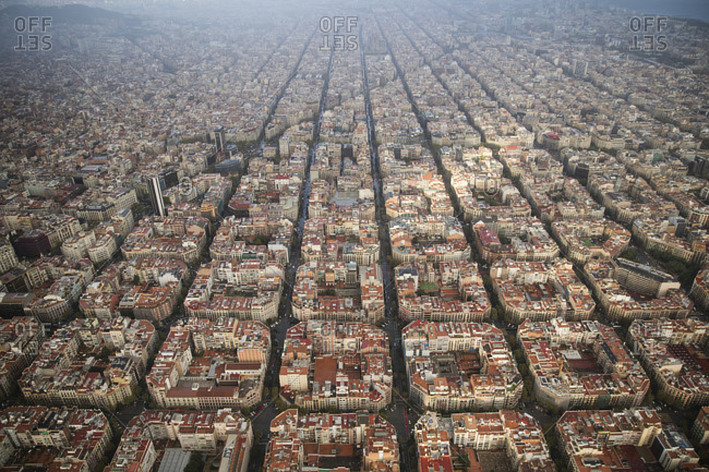 In the 19th century, the Eixample district, covering an area of 7.5 km2, was characterized by straight, long streets and interspersed with crosses. From the bird's-eye view, the whole area looks like a grid of chess board, contributed by about 200 blocks. In each chessboard, the buildings have the same architectural plan with octagonal cubes, neatly arranged like lego sticks. 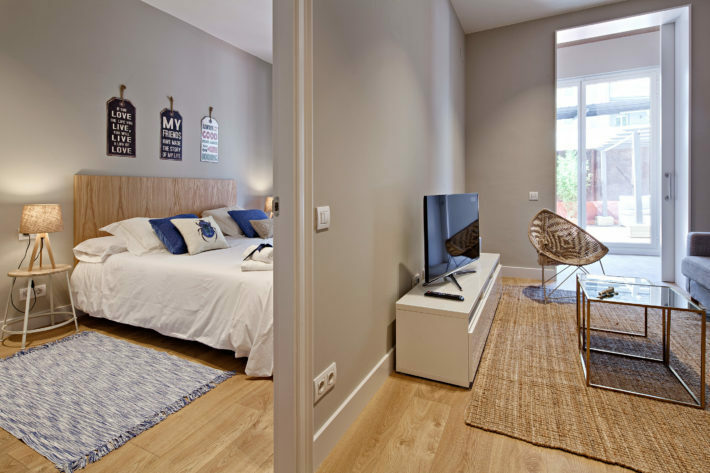 The apartment is situated on Ronda Universitat Street, in the Eixample district, which is best known for its architecture, exclusive boutiques, restaurants and coffee shops. Ronda de la Universitat is a major thoroughfare of central Barcelona, connecting two main plazas and Plaza de Cataluña towards Plaza Universitat. Barcelona Plaza Terrace is located in a brilliant center of Barcelona. 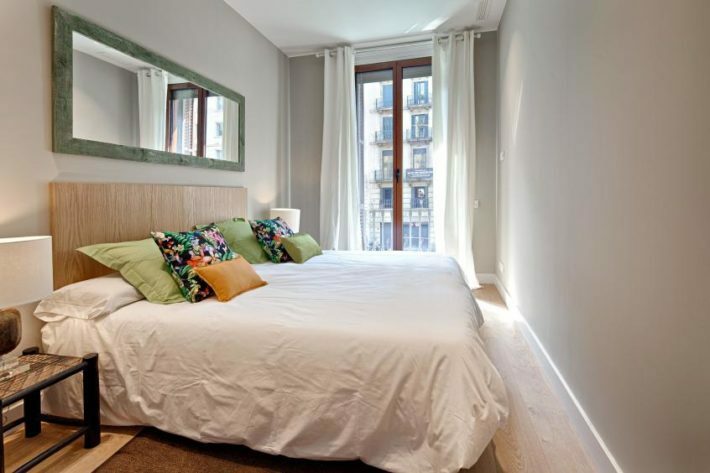 From the apartment, it is easy to reach Plaza Catalunya, Las Ramblas and Passeig de Gracias on foot in a few minutes. Additionally, in walking distance, you can find Gran Vía de Les Corts and the Gothic Quarter. To move around the city, you can take a metro L1, L2 or L3 at Universitat and Catalunya metro stations nearby. In the surrounding area, you can find various restaurants, bar and shops. Plaza de Cataluña – 0.27 km. Plaza de Cataluña is widely known as the very center of Barcelona and it is also the central transport hub of the city. Plaza Universitat – 0.35 km. Plaza de la Universitat is one of Barcelona's central squares, split between the districts of Eixample and Ciutat Vella. Casa Batlló – 0.60 km: Casa Batlló, which is now owned by the Bernat family, the former owners of the Chupa Chups company, was built in 1877 and in the years 1904 to 1906 restored and remodeled by Antoni Gaudí and Josep Maria Jujol. 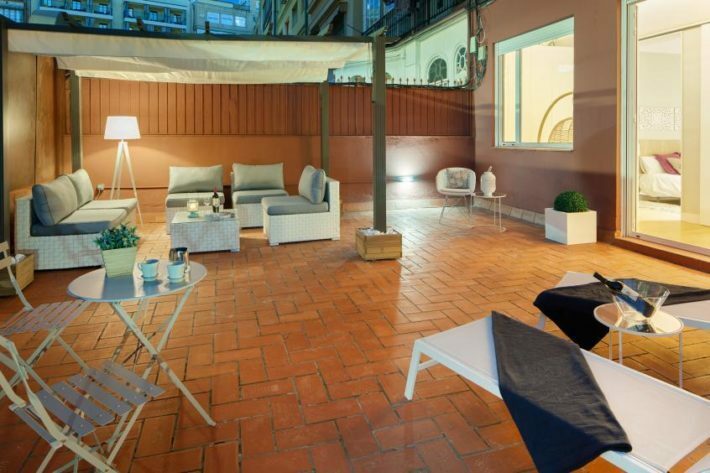 Barcelona Plaza Terrace features six bedrooms and four bathrooms in the area of 200 sqm. The apartment is divided into two independent spaces, each with its own kitchen. Barcelona Plaza Terrace has a spacious terrace, beautifully equipped with sunbeds, chairs, a sofa and a table – just a perfect place for great moments together. The apartment can provide accommodation for 12 people and is highly recommended for two families or a big group of friends who wish to share the vacation but need privacy at the same time. Plan a family or friend vacation in Barcelona? Book a night at Barcelona Plaza Terrace apartment or view the full list of holiday apartments at Habitat Apartments here.